Signs of solar energy’s increasing appeal to growers and farmers continue to proliferate across rural Wisconsin. In the span of three weeks, RENEW took part in three separate events that document how growers are turning to the sun to power their operations as well as to nurture their crops. is powered in part from a 95 kilowatt solar array. The first stop took us to Heartland Farms, one of the nation’s largest suppliers of chipping potatoes to many brands you see on grocery store shelves, located in Adams County a few miles west of Hancock. A fifth generation family operation with over 24,000 acres under cultivation, Heartland dedicated its newly opened Farm Operations, Technology and Training Center on August 4th. On its roof sits a 95-kilowatt array of photovoltaic panels that help power Heartland’s offices and the information technology needed to manage an operation that ships 11,000 semiloads of potatoes each year. Incorporating sustainable features, including an onsite source of renewable electricity, into the functionality of the new building was a top priority of Alicia Pavelski, the family member who oversaw its design and construction. Says Pavelski: "Agriculture and sustainability have gone hand in hand for ages to ensure resources are available for generations to come. With advances in solar energy over the past few years, it was a logical next step for our farm. In the few short months we have had our array, it has been incredible to see the energy it has generated." 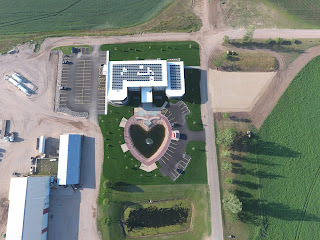 Stevens Point-based North Wind Renewable Energy designed and installed Heartland’s solar electric system. North Wind has constructed similar-sized PV systems for Central Waters Brewery and Blenker Building Systems in Amherst, and Gaea’s Farm, a training facility for horses in Walworth County. used at Brockway Cranberry, Inc., near Black River Falls. The next week found us at the Wisconsin State Cranberry Growers Association (WSCSGA) Summer Meeting, Field Day and Trade Show on the grounds of Brockway Cranberry Inc., located a few miles southeast of Black River Falls. A supplier of cranberries to Ocean Spray, Brockway installed approximately 48 kilowatts of solar generation in 2012 and 2013, which powers the reservoir pumps as well as heats and lights the buildings on the premises. This spring Brockway put in four smaller arrays that aerate the reservoir water at the 86-acre marsh. Thanks to Brockway’s arrays and the abundant sunshine provided by Mother Nature on August 10th, the association’s meeting and trade show was no doubt the first 100% solar-powered cranberry industry event anywhere. For further information on Brockway Cranberry and its owner, Jim Bible, visit the accompanying article by Deb Dorshorst that appears in the program guide for that event. U.S. Solar Mounts, a solar contractor and ground mount system designer in nearby Sparta, constructed all of Brockway’s solar systems. Eric Pipkin, the owner of U.S. Solar Mounts, specializes in designing heavy-duty mounting structures supporting solar installations. His company also engineers and builds custom and containerized power systems (primarily solar) for off-grid and remote applications. Many large food brands have adopted aggressive sustainability goals for their own operations, and they expect their suppliers to adhere to the same tough standards that they do. For Heartland’s Pavelski and Brockway’s Bible, their investment in solar energy flows from a business ethic built around the careful use of natural resources and avoiding waste wherever possible. On August 16th, we journeyed to the Jerry Smith Country Store and Pumpkin Farm a few miles northwest of Kenosha. There, preparations were underway to slot in the final panel on a 9 kW array on the roof of a cheerfully decorated farm stand that has been operating at that location since 1971.
from WTMJ-TV (Channel 4 in Milwaukee). Smith Pumpkin Farm director of fun Beth Dankert shepherded the gathering past the farm’s numerous attractions, which now include several pedestal-mounted tracking arrays in addition to the 27 panels on the store’s roof. "We went from considering a small solar tracker out by our pond to really becoming a business that can operate 110% of our electrical needs off solar," Dankert told a WTMJ-TV reporter. Walter Kreuser of Kenosha-based Kreuser Electric designed and installed the entire 18 kilowatt system, which will be energized before the end of August. A NABCEP-certified installer, Kreuser has also built solar electric systems for University of Wisconsin-Parkside and Gateway Technical College. final panel to the country store's rooftop array. Support from Focus on Energy, Wisconsin’s energy efficiency and renewable energy program, took the form of a rebate totaling $2,400 and a zero-percent loan that covers 50% of the total installation cost. People’s Bank in Silver Lake provided the other half of the financing package for Smith Pumpkin Farm’s solar system. As we at RENEW approach the end of our Summer of Solar - 2016, one thing stands out: each day more and more people are making the connection between clean energy and healthy food, and Wisconsin’s agricultural producers are stepping up to give their customers what they want.